The perceived radical and leftist politics of the city of Tel Aviv, relative to the rest of the state of Israel, is a significant narrative in perpetuating the myth of the Tel Aviv ‘Bubble’. The Tel Aviv Bubble is both an Israeli pejorative and a readily embraced local moniker for a certain Tel Avivian. This is the supposedly laid-back, introverted Mediterranean city of Tel Aviv, detached from and delusional to the realities of the local Israeli-Palestinian conflict and the wider geography political challenges of living in the Middle East. But just how left-leaning is the city of Tel Aviv? Defining what is left, progressive, or which party is leftist, centrist or rightist is a fraught task in a political analysis of any party electoral system. The Israeli theatre of politics is arguably more complex than many others. Issues of national security and (Jewish) ethnic origin do not simply cut across traditional left-right welfare-tax or social issues, they are, arguably, the primary factors in determining who votes for whom. Tel Aviv is certainly the political spiritual home of Meretz. Meretz, depending on one’s political perspective, is a progressive, liberal, gay-friendly, leftist, social democratic party committed to universal human rights and a two-state solution. For others it is a privileged bastion of the Ashkenazi elite, whose origins lie in the subsidised kibbutzim, naïve to Middle Eastern realities, and whose members tend to snobbishly look down on the Israeli masses. Perhaps neither description or caricature is particularly inaccurate or unfair. The party has been labelled as a ‘secular-leftist party’ and ‘proudly left-wing’ in the international media. Meretz received just 4% of the vote, and five seats nationwide in the 2015 Knesset election. In Tel Aviv-Yafo, Meretz (translates as ‘energy’) received 13.1%. The party received in excess of 25% of the vote in a contiguous small cluster of adjoining neighbourhoods in downtown Tel Aviv centred around Rothschild Avenue – home to some 44,000 people – its biggest concentration of the vote in the entire country. The Israeli Labor Party stood on a joint centrist/centre-left platform with Hatnua and the Israeli Green Movement under the umbrella of Zionist Union (in Hebrew, HaMahaneh HaTziyoni, ‘Zionist camp’). The party received 34.3% of the vote in Tel Aviv and 18.7% nationwide. Combining the Labor and Meretz vote, the two centre-left and left-wing parties received 47.4% in Tel Aviv-Yafo but just 22.6% across the whole of Israel. Simply number crunching, with the centre-left polling 24.2 percentage points more than the right in Tel Aviv, but 12.6% less than the right in Israel as a whole, then without a doubt Tel Aviv is certainly more left-wing. A more accurate description of Tel Aviv isn’t one of a leftist Tel Aviv versus the rest of Israel, but something altogether more subtle. It’s a wealthy, disproportionately Ashkenazi north Tel Aviv that’s anchored to the suburbs further north, and a southern poorer Tel Aviv that politically and socially blends almost seamlessly with adjoining suburbs further south. In the wealthy suburbs of north Tel Aviv and in the adjoining wealthy municipality of Ramat HaSharon, the Labor Party (Zionist Union) averaged 45% of the vote. In the largely poorer south-west and south-east of the city, in neighbourhoods stretching from Yafo (Jaffa) in the south-west to Yad Eliyahu in the south-east, the party didn’t manage to top 25%. Labour fared equally poorly in the southern adjoining municipalities of Bat Yam and Holon, getting just 15.2 and 20% respectively. In those same northern wealthy neighbourhoods where Labor dominated, Likud polled on average 12% to 18% of the vote. In the southern, largely poorer neighbourhoods Likud generally polled (outside of Palestinian Jaffa) in the mid to high 30s. In the adjoining southern municipalities of BatYam and Holon, Likud fared equally well with 33.3% and 31% of the vote respectively. It would appear that the relatively wealthy or economically secure in Israel vote ‘left’ and the poor vote ‘right’. The Labor Party, in fact, did not receive a plurality of the vote in a single city, town or village in one of the top 100 poorest or socio-economically vulnerable Israeli local authority communities. The party topped the poll in 45 of the top 50 privileged towns and cities. Labor is not just the largest party in Tel Aviv, but also the largest party in the ad- joining northern suburban municipalities of Kfar Saba, Hod HaSharon, Ra’anana and Herzliya, where it secured in excess of 33% of the vote in all four cities. Arguably, Tel Aviv-Yafo is a tale of three cities. The largely Palestinian Joint List, a coalition of diverse leftist and Palestinian nationalist parties, topped the poll in Adjami and Yafo (Jaffa), securing a plurality in six adjoining neighbourhoods, topping 50% in three of them. The party received just 3% of the vote across all of Tel Aviv-Yafo. Of course, depending on where one draws the borders of Tel Aviv, the power or relative strength of the various voting blocs inevitably rise and fall. Greater Tel Aviv is home to 40% of Israelis. Perhaps not unexpectedly – as home to 2 out of 5 voters – Greater Tel Aviv is fairly representative of Israel as a whole. There is, of course, more to the politics of the Tel Aviv Bubble then simply trawling through the local Tel Avivian electoral geography of Knesset voting patterns. 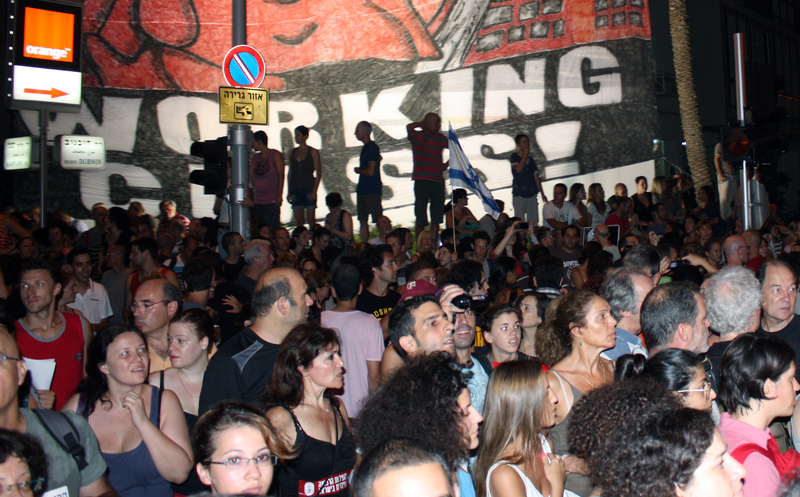 Some 300,000 people took to the streets in Tel Aviv in September 2011 – Israel’s largest ever demonstration – to protest against the cost of living. Demonstrations against the Occupation, if not infrequent, have nevertheless, in recent years, been a tiny fraction of that. In recent years the municipal authority itself has become increasingly politically assertive. The Tel Aviv municipal authority has openly challenged the government on everything from the prosaic rules governing the opening hours of trading on Shabbat, to broader and national issues of pluralism, press freedom and a two-state solution. The city’s elected mayor of 18 years is a frequent vocal and public critic of the nation’s Prime Minister of 11 years. Just hours after a Palestinian terror attack in Tel Aviv in June 2016 which left four dead, its four-times elected mayor, Ron Huldai, openly (and provocatively for many Israelis) directly attributed the attack to the Israeli occupation of the West Bank. Yet this is also a city that many Israelis feel is dismissive, indifferent and occasionally hostile to the rest of Israel. residents of Tel Aviv are mocked for failing to disguise what many Israelis suspect is their true political priority – a desire not to withdraw from the Palestinians in the West Bank, but to disengage from Israelis living outside Tel Aviv. This desire to disengage from the rest of Israel is central to the narrative of the Tel Aviv Bubble. This narrative says that Tel Aviv is both wilfully and naïvely disconnected from the social and political ‘realties’ of Israeli life outside Tel Aviv. By implication, Tel Aviv somehow isn’t real Israel. real Israel lies elsewhere. This dominant and traditional prism of analysis of the narrative of the Tel Aviv Bubble is framed around the supposedly divergent political values or lifestyle of downtown Tel Avivians versus the rest of Israelis. It peddles the myth that this city and its inhabitants live inside a self-created illusion, a mirage of a fantasy of otherness. This is a city that is pejoratively seen as delighting in itself as a Mediterranean beach-city one flight away from Berlin, New York or London. This is a city that looks west not east, a city that provocatively and proudly turns its back on the politics of Jerusalem 40 minutes up the road. It is a bubble that is disconnected, indulgent, indolent even. Tel Avivians, the pejorative cliché goes, sit around in cafés all day long, they hang out on the beach, they party and generally indulge themselves. They tend to favour renting over owning homes. They are wasteful of money. They live for the moment. Yet this indulgent Tel Aviv is also the powerhouse of the Israeli economy. Disposable income per household is 35% higher in Tel Aviv-Yafo than the rest of Israel. The city of Tel Aviv-Yafo, with just 5.2% of the population, accounts for 16.7% of GDP and 28% of hi-tech firms. Tel Aviv-Yafo ($6,890m) dwarfs Jerusalem ($396m) 17 times over in raising seed-funding capital for hi-tech start-ups, with the Tel Avivian city-suburb of Herzylia ($806m) raising twice that of the capital. Greater Tel Aviv accounts for half the economy of Israel. We would argue that the Tel Aviv Bubble is primarily a story of misunderstood urbanism, and that the Bubble narrative is fed unwittingly by a confusion about the hierarchy of place in metropolitan Tel Aviv. Tel Aviv is generally and erroneously viewed as just an- other, albeit larger, more central and wealthier city. It is viewed (by many non-Tel Avivians) as the first city of many in the metropolitan region. There are no fewer than nine ‘cities’ in addition to the city of Tel Aviv located inside the Tel Aviv District. These range in population from Holon (188,000) to Or Yehuda (36,000). There are in fact a further 19 cities in the Central District of Israel – in effect, Greater Tel Aviv. In Israel a ‘city council’ is the official designation of a city under local government administration. The Interior Ministry grants city status to an urban area if that urban area has a population of just 20,000 – a relatively low urban bar to obtain city status. This all contributes to a delusional, polycentric city narrative. This 20,000 city threshold contributes to a misunderstanding of the geography of metropolitan urbanism and suburbanism. Whilst the ‘cities’ of Petah Tikva, Holon, Ramat Gan, Bnei Brak, Rehovot all exceed 100,000 people, none of the centres of these ‘cities’ can boast of a vibrant, diverse or large-scale city-like urban centre. They effectively operate as fringe suburban communities, a significant proportion of whose residents commute to Tel Aviv to work. Their commercial downtowns are largely made up of relatively small strip malls. Culturally they are fringe players in metropolitan Tel Aviv. Holon, perhaps in recognition of this, has cleverly sought to punch above its suburban weight with the Ron Arad Design Museum of Holon. The ‘city’ centre however fails to match this cultural ambition. Ramat Gan is home to the Israeli stock market and the Israeli Diamond Exchange and can boast of an impressive cluster of skyscrapers, but the immediate street area below is a sea of traffic, devoid of attractive urban street life. As ‘cities’ that function as suburban but administratively autonomous municipalities, they can all be best described as ‘suburbalities’. A suburbality is essentially a suburb with an autonomous local government structure. Many of this suburbalities exhibit very high rates of out-commuting. Holon, in fact, has one of the highest, with some 60% of its residents leaving Holon ‘city’ to work.20 Put bluntly, many of the more peripheral municipalities or suburbalities surrounding Tel Aviv suffer a delusion of ‘city-ness’ when in reality they are simply suburbs of varying size and complexity in a single large city, a greater Tel Aviv. The downtown or city centre neighbourhoods of many, perhaps most, ‘western cities’, particularly in the last 20 or 30 years, tend to be wealthier, more liberal, younger, generally more creative, dynamic, vibrant and diverse places in the greater geography of those same cities. All those packed bars, restaurants and coffee shops are also full of the very suburban residents of Greater Tel Aviv who flock to its centre when they can or when they can afford to. It’s simply how cities function. And as for that argument that Tel Avivians spend too much time lounging on the beach, it is worth restating that Tel Aviv is, after all, a city on the beach, its own beach. This city of 52km2 has 14km of coast, the vast majority of it sandy beaches. Of the larger ‘cities’ or metropolitan suburban municipalities that fringe Tel Aviv-Yafo – Holon, Petah Tikva, Ramat HaSharon, rehovot, Bnei Brak, Givatayim, Ramat Sharon, Or Yehuda, Kiryat Ono, Ra’anana, Hod HaSharon and Gvat Shmuel – none have a coastline. If Tel Avivians go often to the beach, perhaps it is simply because they can. Previous How Volatile are the Israeli Voters?